Supplies 250-500 micro-grams bio-available natural calcium and supports absorption and assimilation of calcium from food. Your calcium needs are non-negotiable - strong and healthy bones, hair, nails and teeth all require proper calcium intake. But a diet rich in calcium or taking calcium supplements doesn’t guarantee that your body can assimilate and use it. 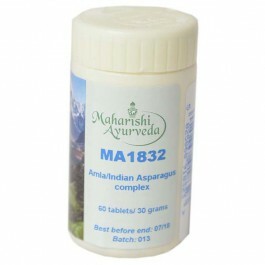 MA1832 Amla/Indian Asparagus complex supplies your body with 250-500 micro-grams. of bioavailable calcium a day and it helps enhance your body’s ability to absorb calcium from the foods you eat. The herbs in MA1832 are combined in precise proportions and prepared in the traditional ayurvedic way. This improves the bioavailability of vital nutrients. It also creates synergy - the collective benefit is much greater than that of isolated, individual herbs. The different sources of natural calcium are meticulously processed in the juices and decoctions of the herbs such that the healing qualities (gunas) of each mineral and herb are enhanced in the whole and any side effects are balanced. Support the body’s ability to absorb and assimilate calcium from the foods you eat. Supplies 250-500 mg. of calcium each day. 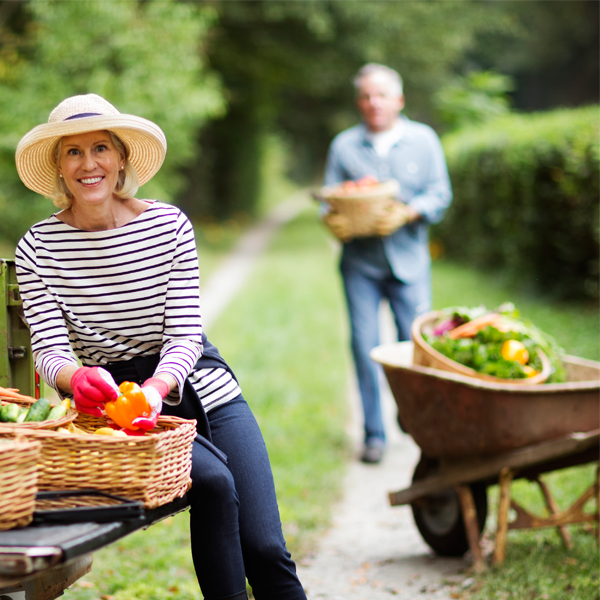 The Reference Nutrient Intake for adults in UK is 700mg/day. Increase the flow of nutrients and energy to cells. Maintain the digestive process that converts fat tissue into healthy bone tissue for healthy bones, teeth, hair and nails. The Indian Tinospora plant has special properties. It aids metabolism and helps clear the channels between the tissues. 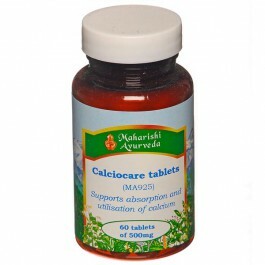 This allows calcium to flow freely to the tissues. This herb also purifies and balances fat tissue (Meda Dhatu), the best raw material for building bones. Amla boosts the bioavailability and absorption of calcium and, in combination with Lime, balances the alkalinity of the formula. Indian Sarsaparilla helps purify fat tissue, essential for the health and strength of bones. Bhumi-amla is a bitter rasayana that supports liver function. 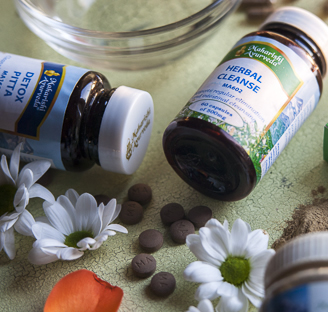 We have a wide selection of herbal and mineral supplements that Maharishi AyurVeda practitioners prescribe for specific individuals. If you have had a consultation from one of our practitioners, and wish to know why MA1832 Amla/Indian Asparagus complex has been recommended, please discuss this with your practitioner. Take 1-2 tablets twice daily with water. Molluscs - Conch shell, Cowry shell, Black lipped oyster pearl.